As the most advanced cooling system WCooliT currently recommends to apply a cooling technology based on rotor heat exchanger. The following solution shows high energy efficiency index, low operating costs, as well as high safety performance. Application of solutions based on rotor heat exchanger allows to fully avoid cooling systems with water, chillers etc. Air heated in a server room goes through a slow rotating heat exchanger and heats it up. The air itself is chilled and returned to a server room. 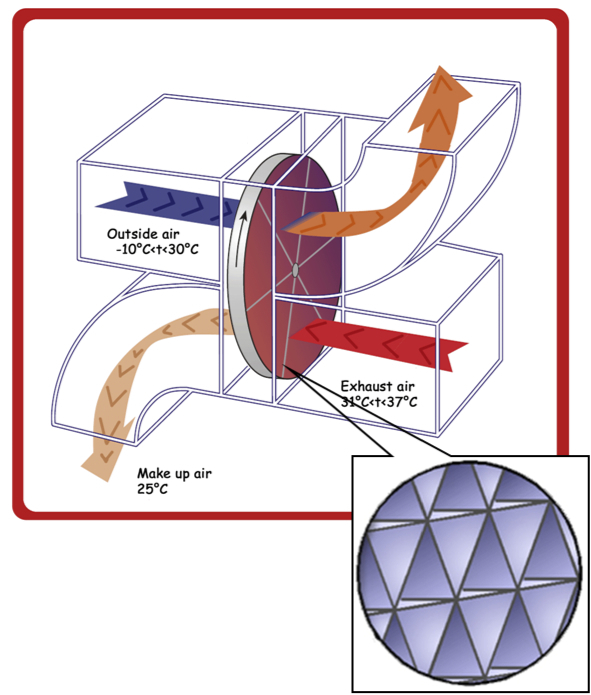 Outdoor cold air goes through a heat exchanger and heats up, cooling the heat exchanger. The warm air is then sent back into the street. As heat exchanger permanently rotates an aforesaid cycle takes place continuously. Rotor rotation speed is chosen to provide for rotor maximum heat capacity, considering the temperature in the street and in a server room. At outdoor temperature of no more than 22 degrees Celsius (assuming that the rack inlet temperature in a server room is 24 degrees Celsius) the air cooling is performed only by rotor heat exchanger. Connection of additional integrated DX cooling system on Freon cycle is performed at temperature above 22 degrees Celsius. These DX’s produce additional cooling. Application of cooling supply system with rotor heat exchanger allows to use outdoor air temperature during 95 – 98 %% of time per year. Implementation of solutions based on rotor heat exchanger allows reducing costs for power supply of cooling supply systems up to 50%. If to evaluate DC energy efficiency with the following solution, PUE could be hold at 1.3 during one year of evaluation.